I’m sure it’s not news to you that we are seeing an exponential rise in the use of social media, especially in the youth demographic. If you read my previous article The Consequences of My Reality Check you may have found solace in the narrative of my experience with my teenage boys due to the parallel situations you have experienced in your own homes (or maybe I have caused you to lose sleep thinking about your sweet toddler and the off-grid home you are now considering building to live out the remainder of his childhood days). Either way, I hope this article brings you a bit of peace and inspiration. After countless hours of research, I have concluded that the leading methods to parental success with kids in the online world are transparency, education and monitoring. As an 80’s baby and a lover of all things technological I like to think that I am up on latest capabilities and benefits of most social media platforms. I use Facebook, Instagram, Twitter, Pinterest and LinkedIn on a daily basis. I market my services, display photos, speak in hashtags and use apps that allow me to post on multiple media platforms with one click. If I have already lost you and you are a parent of a child of any age I beg you to create a profile and begin using one, or more, of these social media sites… if not all of them. The problem with “being on top of it” (aka thinking you know everything) is that 99.9% of the time…. You are sorely mistaken. I learned this in the hardest way! My teen boys learned all too quickly how to hide apps on their phones in pages of folders, create profiles on sites requiring an age minimum with false birth dates, and invent user/profile names I would NEVER think to search. Unfortunately, the possibilities are endless and the methods are all too easy to search on Google and Youtube. 1. Be honest. In the most formative early years of brain development children will ask “why?” because they are curious. They are entertained by the expressions on our face and the inflection of our voice. As a tween/teenager the “why?” begins to form the foundation they will build their morals and standards on. Try to move past labeling social media as dangerous and using the “because I said so” mentality. Have a real conversation about WHY it is dangerous. Discuss scenarios. For example… “You may create a Facebook account but you may only friend people you already know and have interacted with in person.” I could state this rule to my child and then continue on to the next rule on my list, considering it good enough that I have verbally stated the rule… OR I could expand on this thought with “accepting friend requests from a stranger could be dangerous.” This is better… but I could then say “I read a story about a boy your age who…” finish this sentence with an article you read about someone they can relate to who was harmed in some way by connecting with a stranger on Facebook. Show it to them and let them read it… Now “bring it home”… encourage them to imagine how it would feel to have this type of experience happen to them and how you would it would impact you. 2. Construct a Family Contract. As parents, we can easily come up with a list of “don’ts” for using the Internet and posting on profiles. What you may not realize is that kids also have a list of “don’ts” based on the culture, perception and response of their peers. Sit down with your teen and share your boundaries but make sure to ask them about their own boundaries. Encourage them to open up by asking questions like “What is something that one of your friends posted that caused people to react negatively? How did that affect your friend?” … “How would kids at school react to girls in your class posting pictures of a beach day while wearing a very revealing swimsuit?” … “What kind of post would you comment on positively?” … “What is an example of a post that moved you to respond negatively?” … Your kids may surprise you with the rules they have already set for themselves. You can read more about the teen perspective on posting do’s and don’ts published by The New York Times, it’s a very eye-opening article. 3. Perspective. “If you don’t have anything nice to say then don’t say anything at all.” How many times have we beaten this horse? Statistically, our children will fully form the ability to empathize between the ages of 13-15 depending on gender, upbringing, hormones and social pressure. Encouraging them to refrain from making negative comments or forming an opinion and judging a peer based on one post may not hit home unless you find a way to help them make the connection to the way they would feel if they were on the receiving end of this kind of behavior. 4. Read Up and Monitor. The world of technology is developing and changing so quickly it is nearly impossible to keep up with. Educate yourself on tracking/monitoring software for your computers and offers through your wireless providers for your cellular devices and tablets. Set reminders on your calendar to comb through the folders on their personal devices, open unfamiliar apps, check browser history, scroll friends lists and read text messages and view photos. If anything strikes you as inappropriate be sure to approach it as a conversation and not a confrontation if you want your teen to be transparent with you and receptive to your concerns. 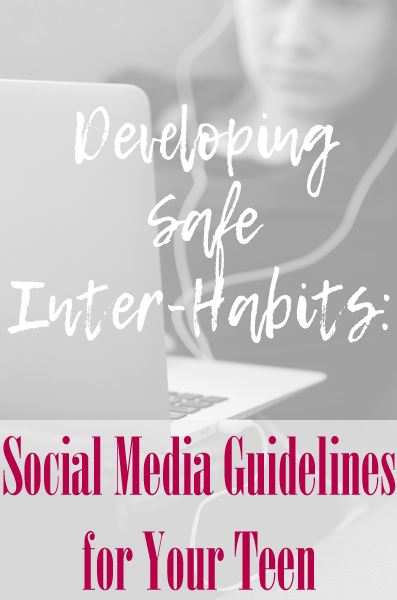 Click on the links below to learn more about the mind of your teen, social media and helpful tools! I'd love to know what is, or isn't, working for you in your home! !